"Tree and Leaf" consists of a seminal essay called "On Fairy-Stories" and "Leaf by Niggle" it offers the underlying philosophy of much of Tolkien's fantastical writings. "Smith of Wootton Major" is a short story by J. R. R. Tolkien about a boy who gets a fay-star in a slice of cake during the Twenty-Four Feast, and explores Faery during the time before the next Feast. "The Homecoming of Beorhtnoth" is a short play or dramatic dialogue in alliterative meter inspired by the Old English poem The Battle of Maldon, plus an introductory essay and afterword. It was originally published in the scholarly journal Essays and Studies in 1953. It has been published in a number of collections with Tolkien's other shorter pieces. Originally published by Allen and Unwin on 30 October 1975; number of copies unknown. It is issued later in a slipcase together with 'the Hobbit' and 'Farmer Giles of Ham [and] the Adventures of Tom Bombadil' on 2 September of 1976. 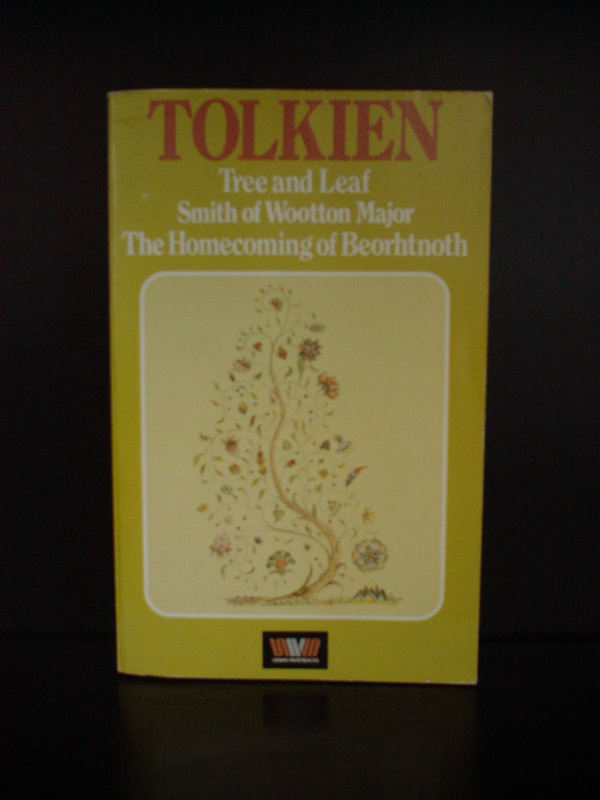 From the third impression on (1979) the cover shows the illustration of a tree by Tolkien himself. This book contains one essay and three stories. You can find these writings in other books or collections, but it's still handy to have them in one edition. Important to know is that this book has no bearing or relation to the Hobbit or Lord of the Rings, for which some readers may be disappointed. The author has many other works besides the Lord of the Rings. Like most well-known artists, they're remembered for their masterpieces, while the lesser-known works are neglected. Sad because these smaller stories are wonderfull! The essay is a discussion of "fairy tales", and gives insight into Tolkien's concept of a "fairy tale", which are not the sugary-sweet, rot-your-mind tales we often imagine when we hear the phrase "fairy tale". "Leaf by Niggle" is a character study in a "little" man who is suprised how his insigificant work turns into something more than he could have imagined. "Smith of Wootton Major" is a story of a man who was privilaged to visit the "perilous realms". The last story, "The Homecoming of Beorhtnoth" also reveals the authors general focus of interest - Anglo-Saxon languages, poetry, etc.